INWOOD — A once-crumbling Academy Street apartment building where residents lived without heat and hot water for years before being evacuated in 2011 reopened on Thursday, to the delight of residents and community leaders. 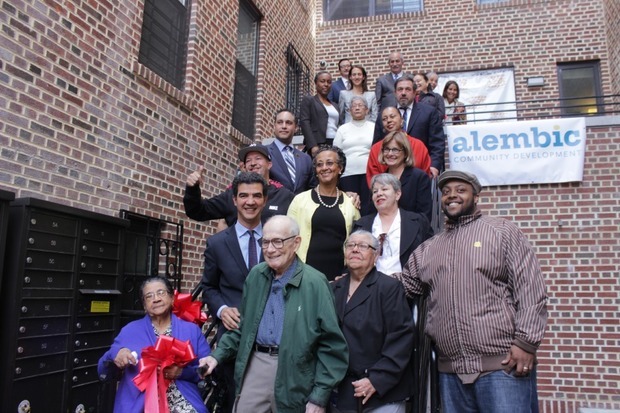 The $22.3 million rehab of 552 Academy St., funded by the city’s Department of Housing Preservation and Development in partnership with Capital One, JP Morgan Chase and Enterprise Community Partners, included stabilizing the 72-unit building and upgrading its existing apartments. The building had more than 1,000 open violations at the time it was evacuated, according to HPD Commissioner Vicki Been. “Severely blighted doesn’t even begin to capture just how bad it was,” Been said at the reopening Thursday..
As DNAinfo reported in 2011, the building's structure was severely compromised, with some of the vacant apartments lacking floors and one section of the hallway so unstable that tenants were told not to use it. In addition to the structural issues, tenants lived without gas, heat and even water for several years before the evacuation. More than half of the apartments were vacant at the time of evacuation, with some of the units attracting for illegal activites like drug-dealing and prostitution, officials said. "The building was literally falling apart," said Tiffany Lopez, 27, who lived at the address her whole life until the evacuation. "There were cracks and sagging floors. Two apartments had burnt down and never been fixed." An entire portion of the building's rear wall had to be demolished and rebuilt, HPD officials said. As part of the rehab, project developer Alembic outfitted the building with new amenities including an elevator, a laundry room and a green roof that will be transformed into a garden. The remodeled units also boast new kitchens and bathrooms. Through HPD's housing lititgation program, building owner Rachel Arfa relinquished control of the propery. She acted as the principal at Ocelot Management, which also owned a number of seriously distressed buildings in The Bronx. “If I had the ability, I really would name the building The Phoenix, because it is rising from the ashes,” said Yvonne Stennett, executive director of the Community League of the Heights. CLOTH, which has assisted tenants who were displaced from the property, will now act as the building’s landlord under HPD’s 7A program. The program transfers ownership of abandoned and neglected buildings to experienced housing organizations. City Councilman Ydanis Rodriguez said that the project was personal for him. Rodriguez worked closely with HPD, CLOTH and the building’s tenants association throughout the four-year rehabilitation process and provided $1.5 million in funding. He credited the tenants association with saving the building. Thirty of the 32 families have now returned to the renovated space. The other 42 apartments were assigned through an HPD lottery for affordable housing. Those families are expected to move into the building in May, said a representative from Alembic. HPD Commissioner Been noted that 50,000 people applied through the lottery. Iris Bertoni, head of the building’s tenant association, noted that the new units are smaller than residents' old apartments, but said that the rehabilitation was succesful overall. "It feels safe now," said Bertoni, 69. "It's a solid structure." Bertoni, who moved into 552 Academy St. in the mid-1960s, said tenants are happy to be back in the building, where some of them had lived for more than 50 years before the evacuation.